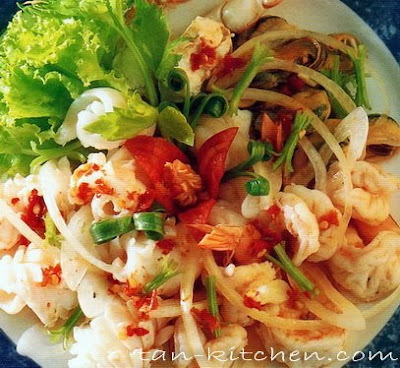 Seafood salad or Thai called "Yam Tha-lay" Every bite of this seafood salad offers a taste-explosion of Thai flavors! At the same time, the dressing never overpowers the fresh taste of the seafood, but rather brings out all of its natural succulence. While nearly every nation bordering an ocean has its own type of seafood salad, you'll definitely find this Thai version to be one of the best! Makes a great appetizer, side dish, or even a main course. Shell vein and wash the prawns reserving the meat only. Clean and wash the squid and cut into bite-size pieces and score them attractively. Immerse in boiling water, the prawn, the squid, and the mussels, for one minute. Arrange the shell-fish and steamed crab sculls on the big bowl. Pound the chillies and garlic well in a mortar mix with the lime juice, fish sauce and sugar and taste. Pour over the shell-fish and celery, toss gently, then arrange on the serving dish and serve with fresh vegetable.